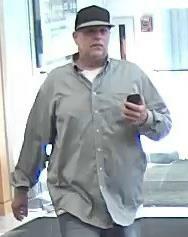 The Palm Beach County Sheriff’s Office needs the public’s assistance identifying a bank robbery suspect. On Monday, December 24, 2018 at 2:55 pm, the male pictured below entered the TD Bank located at 1031 South Military Trail, West Palm Beach and proceeded to rob the bank. The suspect obtained an undisclosed amount of cash and fled from the business. He was picked up by the above depicted car, a Toyota RAV4, occupied by a white female passenger with blonde hair and an unknown driver. The suspect is described as a white male, in his 50’s, heavy set, 6’ tall, and had a scruffy beard. ← The Palm Beach County Sheriff’s Office needs the public’s assistance identifying a suspect Wanted for Business Burglary – Fishing Money out of Drop Boxes.